Let’s be honest-Democrats really don’t want to save DACA. On September 3rd of this year Trump called on Congress to legally solve the Deferred Action for Childhood Arrivals. A policy that has allowed almost a million individuals who entered the country as minors, and have remained in the country illegally, to receive a renewable two-year period of deferred action from deportation and to be eligible for a work. 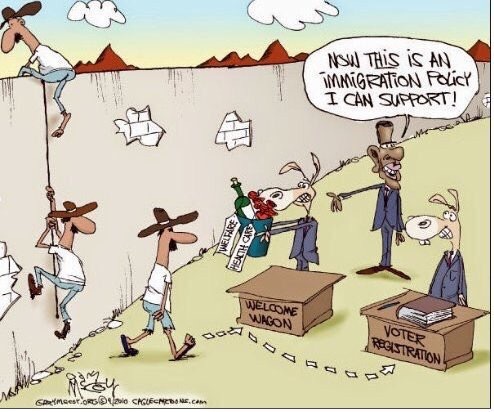 This policy was implemented by Obama but done so unconstitutionally because for true immigration reform Congress must be involved in the legislation process. Points in the plan also entail eliminating the yearly visa lottery that gives at least 50,000 green cards out randomly, and requiring E-Verify (Internet-based system that allows businesses to determine the eligibility of their employees to work in the U.S.) to be used by all businesses. So….here’s the deal. If Democrats and Establishment Republicans REALLY do want to save the Dreamers and fight for these participants to STAY, then they will cooperate with President Trump and negotiate. If Congress refuses to act DACA will END and it will NOT be Trump’s fault. It will be due to the failure for Congress to compromise and work to allow these DACA participants to stay. But if we are going to be straight up honest, Democrats want open borders for votes and the will let DACA end to keep borders open. Establishment Republicans want open borders for cheap labor……both do not care about America or her sovereignty, and it’s disgusting. The ONLY one putting America First is President Trump and those that are willing to work with the President. Ball is in Congresses court and so is ALL THE BLAME. Call your Representative and Senators and tell them to work WITH President Trump!